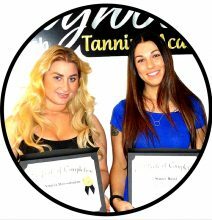 I’m excited to announce our first 2 certified airbrush tanning technicians for the year of 2016. Jacqueline comes from Cedar City, Utah and she is already a well established beauty industry professional. She was already doing airbrush tanning, however, she has never received the proper training and also wanted to advance further into bodybuilding spray tanning. So she decided to come to Los Angeles. She already has her first bodybuilding client and that made her seek out to train with the Hollywood Airbrush Tanning Academy. I’m so glad she did and I’m looking forward to seeing her pictures soon. The second student Christy, came from Colorado and she looked into learning airbrush tanning 2 years ago, however medical conditions prevented her from coming to learn at that time. 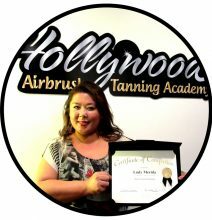 After recovering, she finally decided to come for the hands-on airbrush tanning training and I am so glad to hear that she has a lot of people lined up who are looking forward to getting their airbrush tans. Here are some pictures from this weekends hands-on training class. We always take lot’s of pictures that the students can use later on to start their own portfolio. The models are always so patient and wonderful and many of them are professional models, actors or have other talent. That’s the best part about Los Angeles … we have so many talented individuals here.